Dimensions: 12.5 x 10.5 inches (31.75 x 26.7 cm). 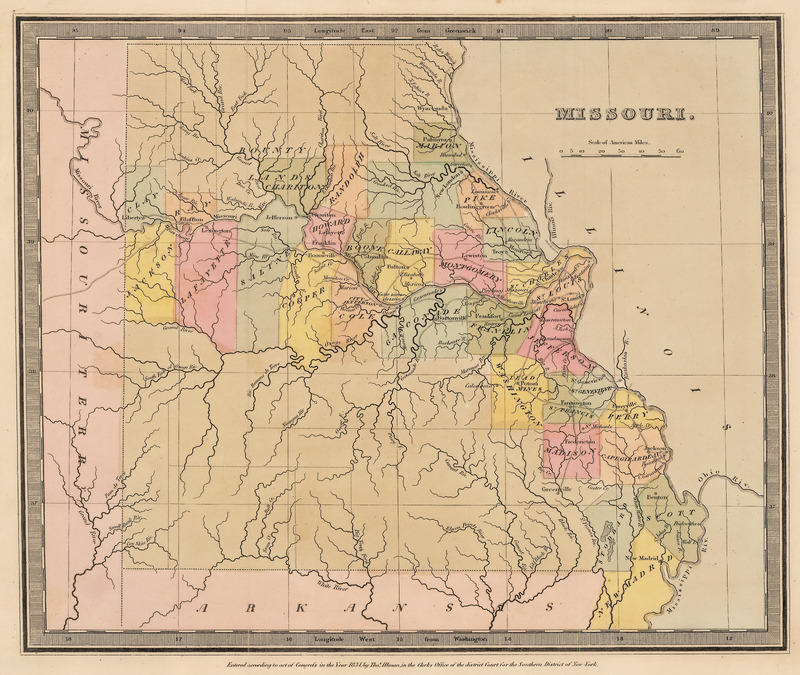 This is a rare example of Burr’s map of Missouri out of “A New Universal Atlas; Comprising Separate Maps Of all the Principal Empires, Kingdoms & States throughout the World,” published in 1835. As noted by Rumsey, this is an earlier example because of the lack of a page number. While the atlas was started by Burr, the majority of it was completed by Thomas Illman as Burr other obligations as an official cartographer for the U.S. Post Office. All the maps completed in Burr’s style. In this map, the state of Missouri consists of 30 counties that remain within the environs of the Mississippi and Missouri Rivers. All other lands not within a county are referred to a Bounty Lands which were lands set aside as compensation for volunteer veterans. This is a great map for anyone with ties to the state of Missouri or an interest in U.S. history. Condition: Map is in A condition with lovely color and a hint of toning.